ESPNChicago.com confirmed on Wednesday that Bill Buckner will be the hitting coach for the Chicago Cubs’ Class A affiliate, (Boise Hawks) this summer, and won’t be returning to Fenway Park to assist the Boston Red Sox newest manager, Bobby Valentine. Bucker spent the past spring and summer coaching the Brockton Rox in the Can-Am League, and led the squad to a 51-42 record. However, the eventual league champions, Quebec Capitales, swept the Rox in the opening round of the playoffs, which ended his stint as the team’s manager. Buckner’s last job held in the big leagues was with the Chicago Sox in ’96-’97, as the hitting coach. The MIAA, (Massachusetts Interscholastic Athletic Association) issued a statement on Wednesday in regards to Saturday’s Division IV-A Super Bowl between Blue Hills Regional Vocational Technical School and Boston Cathedral. The referees flagged Panthers senior quarterback Matthew Owens for raising his left pointer finger for two strides, and deemed it an excessive celebration. Here is the video of the particular play — CLICK HERE. ESPNBoston.com provided the MIAA’s statement on their website, so CLICK HERE to read the statement. Francona said his final good byes to the media and Red Sox Nation yesterday, but overall, he'll certainly be missed! It’s never easy to say, so long, farewell or simply… goodbye. Friday is a day that’ll live in infamy, as Boston Red Sox fans watched Terry Francona walk away from his managerial position and into the sunset. Although, while no one may know the exact reason why Tito decided to pack up and leave his office, it’s certainly fair to say, he was hands down the right guy for the job. Francona inherited a group of “idiots” that became legends after their most improbable comeback against the New York Yankees in ’04. He also ended Boston’s miserable ongoing curse against the St. Louis Cardinals in the October Classic, and won an additional title three years later against the Colorado Rockies. Yet, besides leading the Red Sox to two World Series championships, he was also considered a “players manager.” Guys like Dustin Pedroia and Kevin Millar gelled quite well under him, while players like Manny Ramirez or Pedro Martinez butted heads, but still respected his decisions. He’ll certainly be missed and yes, it will be quite different seeing someone else sporting a Boston uniform, and calling the shots next season, but overall, he’ll always be remembered as the manager that sent Babe Ruth’s curse to the grave, and brought the spirit of baseball back to the Hub. Should We Blame President Obama for Rajon Rondo’s Shooting Woes? 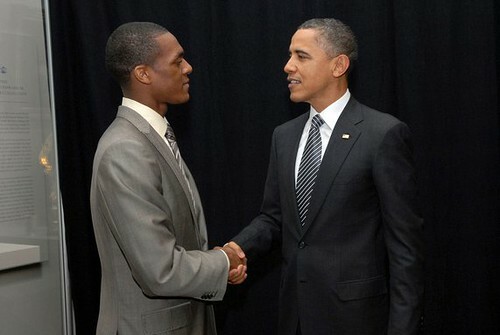 Did President Obama really insult Rajon Rondo's shooting ability? As American citizens, it’s quite easy to point fingers at the President of the United States, especially if it’s Barack Obama, however, some sports fans might want to reconsider why we’re blaming the commander and chief, who apparently “destroyed” Rajon Rondo’s shooting ability this past spring. It’s not totally certain that Obama is the reason for Rondo’s poor shooting statistics with the Boston Celtics in March or April, but it’s quite possible that America’s leader stated something that affected the point guard, right? Yet, how could one’s words derail an athlete? Seriously, how? Well, according to multiple reports on Wednesday morning, as well as a portion of Shaquille O’Neal’s memoir with ESPNBoston.com columnist Jackie MacMullan, which is scheduled to debut on November 15, the Big Shamrock regaled the tale of the Green and White’s encounter with President Obama at Boston’s Museum of Fine Arts this past March. In early March some of the guys went to the museum of Fine Arts for a fund-raiser and got to hang with President Barack Obama. Everyone was a little bit in awe. The President turns to Ray, points at Rondo, and says, “Hey, Ray, why don’t you teach this kid how to shoot?” Everyone starts laughing. So, with this being the case, one might have to wonder, should we indeed blame Obama for Rondo’s shooting woes? Again, how can one person impact a player’s shooting ability? Obama is indeed a true basketball supporter, however, it just seems rather bizarre that we’re all pointing the finger at him. * Information for this specific post was also gathered from Kelly Dwyer‘s report on Yahoo! Sports.